Welcome to this weeks Bloggers Challenge, where the theme is Alter It. I know you've got supplies in your stash that are just begging to be altered, so why not drag them out, play along and link your project to this post, so we can all see them! Personally I can't even tell you how long I've had this naked frame in my stash of alterables. As you can see, I photographed what was inside the frame as it had the information on the maker - Stamp Its. It's a magnetic paper frame, but the frame covering actually has a bit of texture to it. I wasn't quite sure how it was going to work for my stamp surface, but once finished, it looks kinda like a piece of material. I used a beautiful Mandella stamp from Two Nancys Art Stamps as my image. Stamping in Grey, Rich Razzleberry and Black using the Depth of Field Technique from the TJNL. While I realize the technique doesn't call for Black Ink, I think it gives it a pit of pop. Once finished I sponged Rich Razzleberry around the edges. 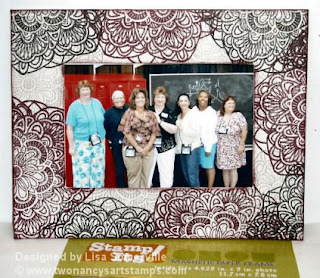 I had a hard time finding a picture, but came across one of a group of friends that was taken at a Stampin' Up! Convention a few years ago. Thanks for stopping by, be sure to click on the Bloggers Challenge Logo on my side bar to see what altered items the Challenge Team created. So pretty Lisa. Great job on bringing it up to date. This is stunning, Lisa!! i really like the way the black looks with this technique...so beautiful!! Very cool Lisa! Those are great stamps! I think I have some of these frames too! You may have inspired me to actually do something with them now! That stamp is really pretty - perfect for this project. Great job! I just love the medallion image. It looks exactly like fabric!! Here is a link to my altered picture frame. I am feeling like it needs some bling now, so I will have to add some. The picture has a lot of detail and originally I thought that might be enough. So pretty, Lisa! I have a few of these in my stash, too. Great technique for the frame. Love the photo too! Nice frame, Lisa...the Black does make it POP! I think I still have a couple of things hanging around, too! Great job with the frame. I like the image you chose and the colors look fabulous together. It really is stunning! Great color choices. Love your frame Lisa... it's an excellent way to use those mats...! What a great frame - I loved seeing those familiar faces! The frame is so elegant! You did a wonderful job! Great job on the frame!!! I know I am one that has tons of things laying around ready to be prettied up!! !